In the current uncertain and potentially volatile market environment, a portfolio with high quality, short-term fixed income securities at its core can deliver attractive, inflation-adjusted returns. This core would consist primarily of investment grade-rated U.S. corporate bonds, Treasury notes, municipal bonds and similar securities. The portfolio would primarily employ a buy-and-hold strategy. To minimize interest rate risk, the average maturity of the bonds in the portfolio ought to be kept at three to five years. 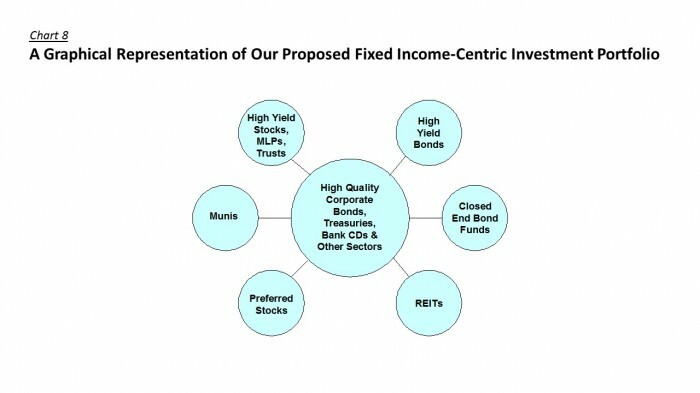 The targeted long-term return on the portfolio would be 50-100 basis points over the rate of inflation. With inflation running around 1.0%-1.5% currently, the goal under current market conditions would be to achieve a total return of 2%-3%. Today, this translates into an average yield spread of 35-150 basis points over Treasuries. Given current low spreads at this average maturity and quality level, we probably will have to work diligently to achieve this goal. We would continue to focus on U.S. corporate bonds rated double-A to BBB. This remains, we think, a good place to play. This lower range of the investment grade sector still offers reasonable (but clearly skinnier) yield spreads at acceptable levels of risk. Outside of the core, we can also look at certain sectors that have the potential to deliver higher tax- and inflation-adjusted returns. These might include high yield corporate bonds, REITs, closed end bond funds, municipal bonds, preferred stocks and even certain high yielding equities, such as master limited partnerships. Obviously, many of these investments are higher risk; but we would limit them to around 30% of the portfolio. Over time the composition of the portfolio will shift gradually in response to market conditions. For example, if yield spreads rise sharply – well above the rate of inflation – we might shift the portfolio’s exposure toward higher rated bonds to meet our target return objectives with less risk. At the same time, we might conclude, even in a tougher economic environment, that the selling in lower quality sectors, for certain select issuers was overdone, In that case, we might increase our exposure to junk bonds to augment returns. In this way, we should be responsive to current market opportunities and risks, recognizing, however, that portfolio changes are likely be gradual, because we have committed most of our funds to investments that we intend to hold to maturity. We should only consider selling securities before maturity in unusual circumstances – say in response to a significant deterioration in a bond issuer’s financial condition or future prospects or, alternatively, a sharp run up in price that does not appear to be justified. Those who followed this strategy when we first proposed it in 2008 should have realized superior returns through the financial crisis and beyond. Admittedly, the risk/reward profile of this strategy is not as attractive today, given the big multi-year run-up in bond prices, but we think that it can still deliver attractive risk-adjusted returns over the long haul. In baseball terms, the goal here is to focus on hitting singles and an occasional double and not to swing for the fences; so we should end up striking out less often. Originally published February 28, 2008. Updated most recently on May 8, 2014.